The Natural History Museum provides an intriguing view into the natural world. Discover dinosaurs, volcanoes, creepy crawlies and precious gems in the many exhibitions. The Museum also houses the Darwin Centre, an awe-inspiring public space that allows visitors to explore the natural world in an exciting and innovative way. 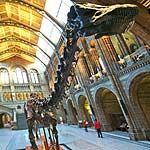 Do you work at Natural History Museum? What did you think of Natural History Museum?